From food, fashion, entertainment, product testing and biomedical research, the Ghosts are the billions of (invisible) animals used within global consumer industries. “Ghost-Free Journey”; “Ghost-Free”; “For The Ghosts”; #fortheghosts … this language has become synonymous with THE GHOSTS IN OUR MACHINE cross-platform documentary. To be “Ghost-Free” literally means to be vegan, and a vegan is someone who chooses to not use, eat, wear, consume animals. The Ghost-Free Journey (GFJ) was facilitated by Donna Oakes & Rosemary Tarentino Foos, together they fostered and inspired an accessible learning experience for a broad spectrum of people interested in transitioning to, and maintaining a Ghost-Free life. From 2011 – 2014 they conducted a total of 14 customized GFJ’s with 44 participants through our “5-Day Ghost-Free Journey” (GFJ). It started on Facebook and then migrated to The Ghosts In Our Machine’s website. 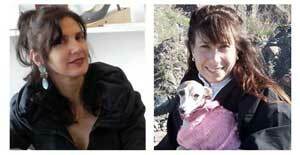 Donna & Rosemary tailored journeys specific to the needs, questions and pace of individuals. See archive of “Previous Journeys“. In 2014, the Ghost-Free Journey returned to Facebook, where Donna and Rosemary conducted a friendly, welcoming and informative Ghost-Free Monday each week on The Ghosts In Our Machine’s official facebook page.